Ted thinks this is another Gordon Tidey photo. Prince of Wales no. 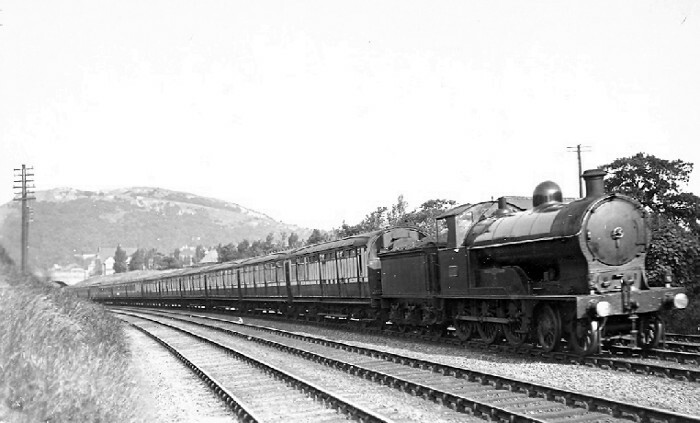 1454 Coquette approaching Colwyn Bay on an Up train, probably about 1920. On the back of the photo is the inscription first six coaches are special stock for working between Liverpool and Newcastle on Tyne. Side boards read: 'Liverpool Lime St - Manchester Exchange - Leeds New - Newcastle on Tyne. Does anyone know what this stock is doing on North Wales? The train is one of the Liverpool - Newcastle sets built in 1917 with recessed doors following clearance problems on the NER line. Only one of the two LNWR sets was in use on the Newcastle service at a time, as the NER provided the other train set. On summer Saturdays the spare set was regularly used for excursion traffic to/from North Wales, and this is not the only photograph showing these carriages in that role.